Always use flame-resistant barbecue mitts and barbecue tools with long, heat-resistant handles. Have proper lid or grill top. Keep barbecue grills in a level position at all times. An unstable unit can easily be tipped over. Place barbecue grills at lease five feet away from any combustible material. Place your grill so that sparks and smoke won’t fly toward buildings, furniture or people. Use only enough charcoal to last for the time it will be needed. Properly attach your ash catcher to the kettle grill. Douse the coals thoroughly with water after grilling. Transport, store and use the propane gas cylinder in an upright position. Never leave infants, children or pets near an unattended hot barbeque grill. Never add liquid starter to hot or even warm coals. Never wear loose clothing around a hot barbeque grill; it could catch on fire. Never grill on a wooden deck. 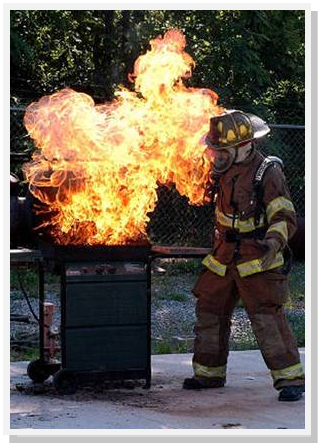 Never barbeque in a confined space. Never use gasoline, kerosene, alcohol or a cigarette lighter to start a fire. Never move outdoor barbecues indoors. Smoldering charcoal can build up lethal concentrations of carbon monoxide. Never store briquettes outside where they can get wet. When they are dry, they become a flammable solid creating a fire hazard. Never discard used briquettes in a cardboard carton or any other combustible container.